Once the industrial heart of the region of Catalonia in Spain, Barcelona could have become just another burnt-out, rust-belt European city that failed to find a role in the modern, globalized world. But what set Barcelona apart from other European cities was a visionary local government that decided to radically redevelop the city in the run-up to the 1992 Olympics -- a redevelopment that involved all of the city's population. Barcelona today is a model 21st century city, combining historic buildings with modern architecture in a fusion that has helped make it one of the most popular tourist destinations in Europe. 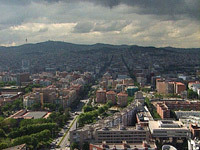 This program from the City Life series starts with a short tour of the city's seafront with Barcelona's Chief Architect Josep Acebillo and UK architect and urban planner Richard Rogers, before moving on to a studio debate on the process at the Special Session of the UN General Assembly in New York in summer 2001, held to review progress from the 1996 UN City Summit in Istanbul. The producer of this program has collected extensive resources at www.tve.org/lifeonline/index.cfm?aid=1118.